Facebook advertising is a quick and easy way to get traffic to your website. Advertising is often thought of as being expensive and an option only for big websites, but you’d be surprised at how affordable it can be. The process of creating a Facebook ad can tell you a lot about your niche audience and the presence it has on Facebook. Facebook has two main types of ads you can create – News Feed and Side Bar. In this particular example, we’ll be looking at News Feed ads that have been quite a hit on both desktop and mobile. 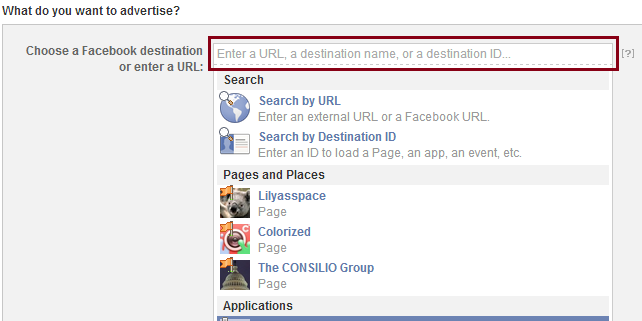 Start by going to facebook.com/advertising and click the “Create an Ad” button. Next you’ll want to choose the URL of the website you’d like to promote. It gives you the option to choose your Facebook Page, but that’s likely to increase your Facebook fans, not sales. The best option would be to choose your Zazzle store URL or your website URL if your goal is to gain sales. Images are typically the most important part of your ad. Your images should be relevant, clean, clear, bright and sized perfectly to the suggested size for the ad (if you are using your Zazzle store URL, Facebook will populate an image for you, but it will be the wrong size, so you will need resize that picture/design). Do not choose pictures with a lot of clutter or text; remember that these ads are highly likely to be seen on mobile devices. Facebook gives you the option to upload up to six images per ad, and that’s definitely an option to take advantage of. Facebook will test all the images you upload, and choose the ones that get the highest response rate when they run your ads. 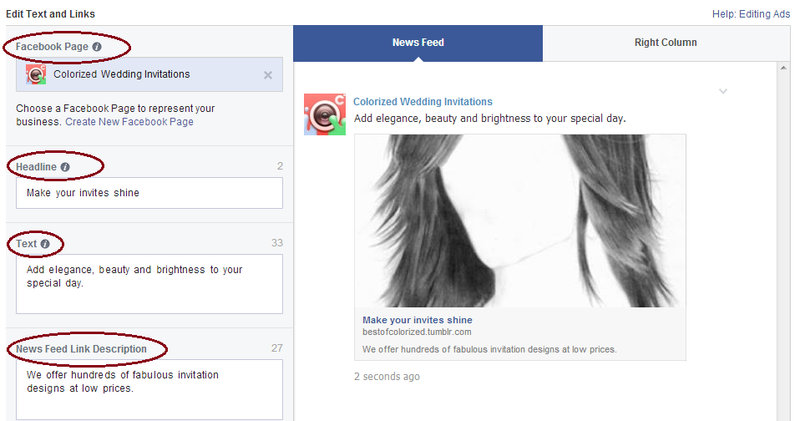 The best part about the Facebook Ad tool is that you can get a preview of your ad as you create it. There are four parts to fill in here and each has a purpose. Facebook Page: Here, you can insert your website’s Facebook Page or create a new one; this way your ad looks like it’s coming from your Facebook Page, but the ad still links to your website. Headline: This is your “attention getter.” What is your value? What is your ad about? What is your call to action? Text: Tell people about what you are promoting in more detail. News Feed Link Description: This gives you a chance to describe your URL in more detail. General tip – keep it catchy, short and to the point. I know that seems counter-intuitive to the SEO minds out there, but you only have a person’s attention for a split second before they scroll down their feed, so the ad has to act fast. It is a very helpful exercise to think about the target audience for your marketing efforts – location, age and gender, interests, etc. Facebook offers a great tool to make this process easy for you. In this example, we will use wedding invitations as our product. Location: Choose all countries that pertain to your inventory. Can your product be sold abroad? Do you have it translated? Do you already receive traffic from certain countries? Age: Are wedding invitations for all ages? What age do people usually get married or engaged? Gender: Who are the main planners and buyers for wedding events, men or women? Precise interests: This is the most important part of your targeting. You’d like to target people that are interested in what? Is “wedding” too broad of a target? Is “wedding invitation” too small? As you narrow or broaden your targeting, the audience count on the right-hand side of your screen can help you make your decision. From personal experience, I’ve had the best results with targeting between 1MM and 5MM people. It’s also good to keep an eye on your suggested bid because that’s what you will be paying per click for your ad. Suggested Likes and Interests: These are Facebook’s automatic suggestions based on your original precise interest. The assumption is, if you like “wedding” you may also like “ceremony” or if you like “wedding invitation you may also be interested in “RSVP”. Broad Categories: These will target folks that have similar interests and traits like “Home & Garden”. I find these most useful for mobile. If I am promoting an iPhone app or Android app, for example, here I can select which mobile users I want to target. For example, if I’m selling a wedding app, I can choose “wedding” for my precise interest and “android” in my broad category. Connections: This section gives you the option to show your ad only to people that are somehow connected to your page or someone else’s page. I would suggested bypassing this option because it usually lowers your audience count dramatically. Interested in: This is up to you to decide, depending on the product you have. 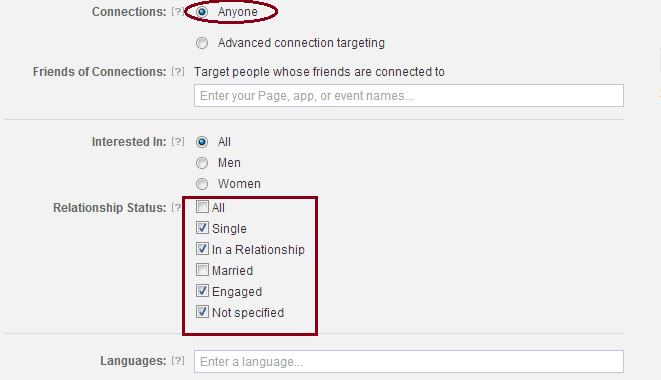 Relationship status: Normally, for majority of products, this section is probably left to it’s default which it “All”. However, for wedding invitations I would choose every status except the married status because married people are less likely to need or be interested in wedding invitations. Languages: If you only have invitations in a certain language, other than English, then I would probably fill this out. Otherwise, leave it blank. Education: Does your product require people to have a certain level of education? Most of the time this is set to default. Workplaces: This targets people that work for a specific company. This dramatically lowers your audience, and is an option that’s hardly used. New Campaign Name: Name of your campaign. Campaign Schedule: Enter specific dates you want for your campaign or have it run continuously. Usually, it’s probably best to run your campaign continuously, unless you create your ads early on and need to run them at a later date because of seasonality. Conversion Tracking: This requires technical skill, but it’s a great attribute. It lets you keep track of actions (e.g. sales) taken on your website after a person clicks on ad. It’ can help you see what ads convert into sales more. Optimization: This is where you need to decide how you would like to spend your money on your ads. Do you prefer to pay per click or per impression? I would suggested trying both if you can to see where you get the most conversions. You also have the option to manually bid for clicks pr impressions (choose the amount you’d like to bid), or let Facebook optimize your ad for you. If you are not spending a lot of money, I would suggest to let Facebook optimize for you. Pricing: You will only have to fill out this section if you are manually placing your bids. Then click “Place Order” and you are all set. There is a short waiting period while Facebook approves your ads, and then they will go live. Facebook also provides you with great ways to track your ad’s performance, so you always know how much money is spent on each ad and how each ad is performing. Facebook ads are a great way to get folks on your site, so if you have a little extra for investment, it’s definitely an option to test out. It would be great if Zazzle would add a way to add the facebook pixel so that we could track conversion… I believe you would see a lot more people sending more traffic if we could use the detailed reporting a pixel would allow. Without it, it just pushed people to systems like shopify and other POD tee that support that system. I would think it wouldn’t be that difficult to add, we already can add Google analytic.